On February 3, 2010, In foreign investment, lifestyle, tourism, by InvestBA. 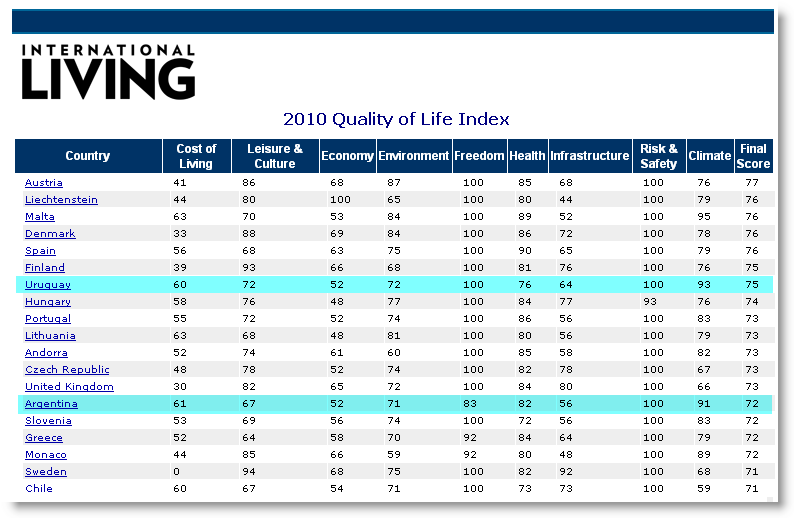 Argentina and Uruguay were the top 2 Latin destinations in IL's Annual Quality of Life Index. January’s headlines out of BA were either steeped in controversy (The debt row and Central Bank standoff) or sexual scandal (Fake Viagra from China and Cristina’s pork promotion.) Yet, despite all of the infighting and innuendo, there was one very positive piece of news that merits repeating for those contemplating relocation to Argentina. For the second consecutive year, Argentina and Uruguay were the two highest ranking Latin American countries in International Living’s annual 2010 Quality of Life Index. (Click image to enlarge) On the 1-100 scale, Argentina received its highest marks in the categories of Risk & Safety (100), Climate (91), Freedom (83) and Health (82). Of the 194 countries surveyed, Argentina ranked #26 sandwiched right between the United Kingdom and Slovenia; however, Argentina’s Cost of Living score (61) was actually 2x better than the U.K.’s (30). Neighboring Uruguay, another InvestBA favorite along the Tango Coast, garnered the #19 spot on the IL 2010 Index, sandwiched right between more expensive and significantly colder European competitors, Finland and Hungary. In a related story, data released this week from Argentina’s Tourist Ministry suggests a record number of foreigners traveled to Argentina in January “buoyed by an improved global economic situation and competitive prices at the country’s different destinations relative to those of its neighbors.” The entire 2010 Quality of Life Index ranking is available at InternationalLiving.com .